I would say that we skimmed over the surface of Montreal today, except that we also spent some time underground. Most of the day though passed as we sat upstairs on open double-decker buses, cruising the streets, detouring around the many road and building repairs, sneaking through stop-signs (possibly the most common illegal thing that Canadians do) and getting three different versions of the official commentary. These hop-on, hop-off tours (HoHo to those of us in the know) are a great way to get the lie of the land, but you are at the mercy of weather, traffic and the guide’s level of enthusiasm/boredom. The wind was pretty vigorous today, and was ripping the leaves off the trees and swirling them about the streets; but there were still plenty enough left for more leaf-peeping ecstasy. It’s true what guide André said, that they show up better on a dull day than in the sunshine, contrary to what you’d think. They seem to glow. They were eclipsed by the glass sculpture outside the Musée des Beaux-Arts, though: Dale Chihuly again, he does keep cropping up. This one is very big, called something like The Sun, and – here’s Canada for you in a nutshell – sitting outside on the steps with only a flimsy nylon guard rail around it. Fancy, delicate glass! Amazing. 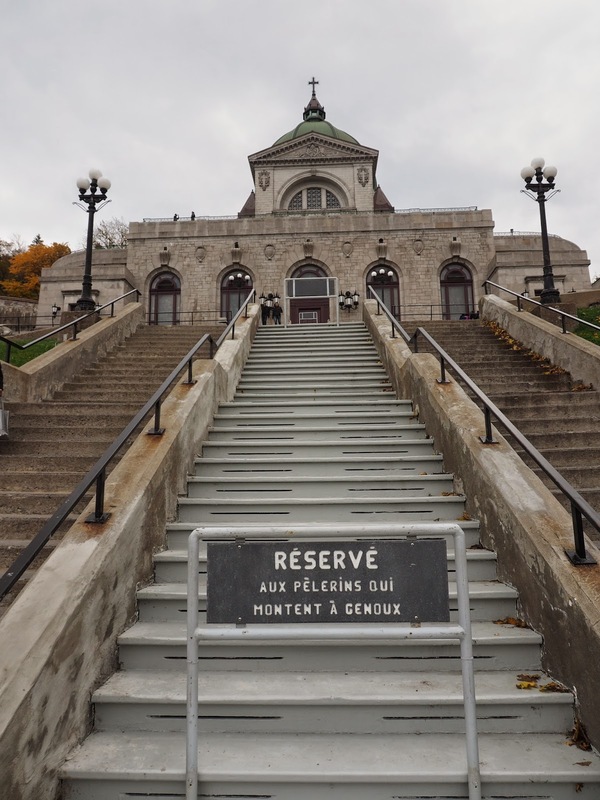 Also amazing, in a less inspiring way, was the notice on the central, painted wood section of stairs on the hill up to the Oratory: reserved for pilgrims on their knees, it said. On their knees! It’s a beautiful, sparely-decorated building, but that’s irrelevant: they come in their droves hoping for miracles and occasionally apparently getting one, if the stacks of abandoned crutches in one of the chapels is proof. It’s the human brain that’s the real marvel here, I reckon. After the trees, the buildings modern and classical, the shops above and underground, the crisply delicate mille-feuilles and the sticky réligieuse au café, there was finally an unpretentious dinner at Dunn’s Famous (no further noun evidently required). The specialty was Montreal’s smoked meat, which turned out to be a moist, tender and slightly spicy corned beef, served with excellent chips, coleslaw and a dill pickle. You get to decide how much fat it comes with – so, obviously not a diet option, and therefore pretty much guaranteed to be tasty. And so it was. Recommended, especially with a Rickard’s White, orange slice included: a fine way to finish our Canadian sector. Final random note: It's a curious, but noticeably distinctive feature of French Canadians speaking English, that their accent sounds remarkably like the voice of Stephen Hawking. Yes? No? Just me, then?